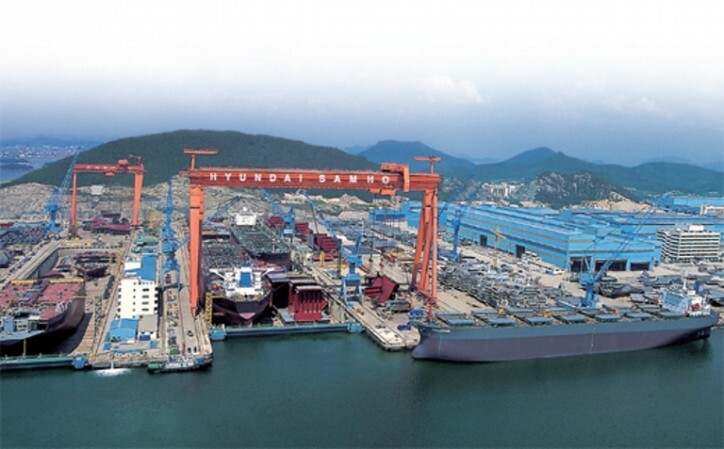 Hyundai Samho Heavy Industries (HSHI), a shipbuilding affiliate of Hyundai Heavy Industries (HHI), announced today it attracted 300 billion won investment via pre-IPO. Under the agreement HSHI signed with IMM Private Equity, a leading Korean private equity firm, HSHI will issue 5.36 million new convertible preferred shares and IMM PE will pay 300 billion won in total to acquire the shares at 56,000 won per share. That deal brings HSHI’s total market value at 2.5 trillion won. IMM PE’s investment in HSHI today will also serve as an opportunity to re-evaluate the corporate value of HHI that takes up 83.7% of HSHI. The investment of IMM PE that has been inactive in investing in shipping and shipbuilding sectors including Hanjin Newport and Hyundai Merchant Marine’s LNG business shows its confidence in the recovery of shipbuilding industry for years to come. Even in 2016 when market conditions were adverse with a dearth of orders, HSHI turned a profit with 3.8686 trillion won in sales and 171.5 billion won in operating profits with new orders of 15 ships valued at $1.1 billion in total. Moreover in March this year, HSHI won $240 million order to build four units of the world’s first LNG-fueled Ice-Clas Aframax tankers from Sovcomflot, the Russia’s state-owned shipping company. IMM PE is a leading Korean private equity firm that was established in 2006. IMM PE has currently $2.5 billion worth asset under management and has been investing in sectors including consumer/industrial goods and health care.